MURRIETA, Calif. – Two men who were arrested for reading the Bible aloud outside of a California Department of Motor Vehicles (DMV) office were found not guilty today in a state superior court. Riverside County Judge Timothy Freer agreed with attorneys for Pastor Brett Coronado and Mark Mackey that the prosecution failed to prove that the men had violated the law with their evangelistic activities. 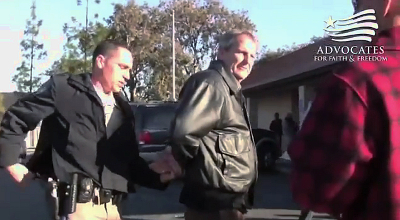 As previously reported, the incident occurred in February 2011 when Coronado and Mackey, along with their friend Edward Florez, Jr., went to the DMV in Hemet early one morning to evangelize those who were waiting for the facility to open. As they stood in the publicly-owned parking lot, approximately 40 feet from the entrance, Mackey began to read out loud from the Bible. After being released, the men retained the help of the Christian legal organization Advocates for Faith and Freedom, which soon filed a federal lawsuit against California Highway Patrol. However, Riverside County District Attorney Paul Zellerbach responded by charging two of the men, Mackey and Coronado, with trespassing for failing to obtain a permit to conduct a “demonstration or gathering in or upon any state buildings or grounds” and ordered the Christians to stand trial. Tyler said that he found it interesting that the prosecution decided not to call the arresting officer to the stand. “I think part of it is because they knew we would have cross examined him significantly on this idea that the officer claimed that they were violating the law [by] preaching to a captive audience,” he stated. Instead, with the new trespassing charge leveled by Zellerbach’s office, the prosecution had to prove that the men were engaged in a “demonstration or gathering.” In order to evince guilt, prosecutor Scott Mason had to establish that the men drew a crowd, as opposed to merely speaking in the vicinity of those who were waiting in line to enter the DMV. “The prosecution failed to meet their burden of proof. They did not prove beyond a reasonable doubt that our clients committed a crime under the law that they charged them with,” he outlined. During the trial Tuesday, Tyler made a motion for a directed verdict just before it came time to put on evidence for the defense. Judge Freer granted the motion, stating that the prosecution’s argument was unconvincing. Tyler says that he will now proceed with the civil suit that he filed against California Highway Patrol, which has been on hold pending the outcome of the trial.